The feeling was startling enough that I walked out, grasping the crumbled paper in my pocket as if doing so could somehow keep that answering smile from tugging on my lips. A snap and a roar of fury echoed across the lands, scattering the birds. When I climbed out of the tree and walked into the little learning, I merely crossed my arms and looked up at the High Lord, dangling by his legs from the snare I'd laid. Even upside down, he smiled lazily at me as I approached. "Cruel human." "That's what you get for stalking someone." Once upon a time Gillian at Writer of Wrongs wrote that A Court of Thorns and Roses is "better than the first Throne of Glass" and I cried foul! Impossible! Yes, Sarah is a goddess among authors, but to possibly top her Throne of Glass series?! No. No way. No fricken - OMG IT'S SO MUCH BETTER! 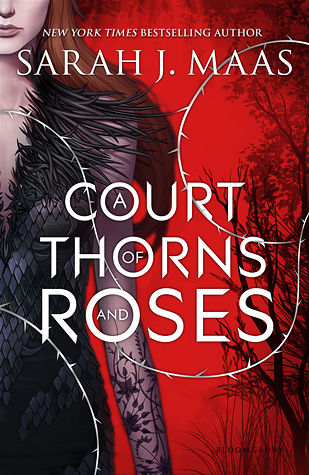 A Court of Thorns and Roses is everything and more. Feyre is the youngest of three daughters, the elder of two whom are pretty useless, and their father doesn't fair much better than his eldest two daughters. Feyre takes it upon her self, at a rather young age, to hunt and provide for her family. She's a self-trained hunter and has been keeping her family fed through their poverty. Until one day she kills a wolf deep within the woods and her life is forever changed. Unlike Beauty and the Beast where there is a huge castle in the woods that nobody (not even the neighboring village seem aware of, but that's a whole other issue), in A Court of Thorns and Roses they are well aware of the fairy lands and the danger these fairies posses. I absolutely love love love love love Sarah's take on Beauty and the Beast. Her story starts out similar to the tale as old as time, but she eventually weaves it into something no small child should be reading. This tale is not for the young or faint of heart. I found myself so engrossed in the story that I completely tuned everything out - a fact my husband loved when it was well past dinner time and I hadn't even noticed my own stomach was grumbling. But I couldn't put this book down. Not only is Sarah's prose engrossing but her characters are flawless. I mean, they have flaws, but they're written perfectly. Feyre is brave and determined, even after she has accepted her fate in the fae world she makes herself a map of Tamlin's house because if she "were to remain here, it was essential to know the best hiding places, the easiest way out, should things ever go badly." Tamlin is all the things you want in a love interest. He's caring, loving, seductive, but also protective. She's new to the world of fae and knows nothing of its dangerous, so his protectiveness comes of as legit instead of an "I man, you woman" macho attitude. And their romance is achingly slow. Perfectly, achingly slow. There's no rush to their relationship and it becomes a true and genuine attraction. We are talking OTP levels here, people! O.T.P. Which is fine by me because they can have each other and I'll take Rhysand. Everyone wins! A Court of Thorns and Roses stuck with me for days and I still don't think I'm over it. I am anxiously awaiting more information on the next book in this series and without a doubt will be counting down the days until its release (only six months and five days to go!). Just be aware that you're going to want to read this book when you have little to no responsibilities because tearing yourself away from Feyre's story is going to be damn near impossible.